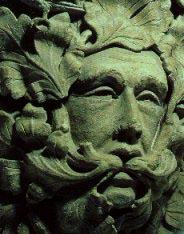 I have often wondered about and been fascinated by the idea of the Green Man. "Often labelled merely a 'grotesque' or a 'gargoyle', the Green Man can be found all over Western Europe and in parts of Asia and North Africa. He is not a gargoyle, he is an archetypal image. From Mesopotamia of the third millennium BC to the close of this present era, the Green Man has been there, hidden in the texts of the great epics and peering down at us from the roofs of the great cathedrals of Europe. But somewhere along the way, we seem to have lost the thread of his narrative." We so often come across this image in the antiques we find, in carvings, fountain heads, masks on urns and pedestals and have often wondered about it. I came across a little book the other day by Mike Harding all about the origins of the Green Man. He has researched this across the world over the past 25 years and it is fascinating to read about the different interpretations. “One common theme unites them all however and that is the communion or fusion between man and the vegetable world.” Hence the link with gardens and plants. Pagan in origin yet so evident in Christian places of worship. He writes “All flesh is grass, and the Green Man, perhaps better than any other image illustrates the principle of death and corruption, resurrection and re-birth.” It is an image of man as one with the natural world that I find fascinating. From the Romans in the 6thC AD carving the image onto their columns and other architecture to the Victorians in the19thC, the mystique of the Green Man continues. A couple of places particularly seem interesting. Rosslyn Chapel in Scotland has an amazing 103 images of the Green Man and only one of Jesus. This chapel was built by William Sinclair in the 15thC. Sinclair was a member of the Knights Templar and surrounded in mystery – aided and infused by certain works of fiction over the years it has to be said! This surely must be worth a visit. The Green Man in Sutton Benger church, Wiltshire is absolutely beautiful. (part pictured above) A carved head peering through the undergrowth with hawthorn coming from his mouth and birds eating the berries. This is in stone dating back to the Middle Ages. Such an intricate carving and strange to find in such a small church. There must be a story to be had there too. The medieval depictions being more grotesque can be found in carvings far and wide – The Romanesque church at Kilpeck in Herefordshire has a wonderful capital by the door with foliage, branches and flowers growing out of the mouth of a grotesque face of the Green Man. Often depicted as a symbol of rebirth, the cycle of growth through the seasons, linked in some way to the legends surrounding the whitethorn or hawthorn bushes. The common theme is one of man entwined with and part of nature. I for one will be looking out for this face in the undergrowth on my travels around the country. We have had the most amazing summer this year. Starting for us with the celebration of the Centenary of the Chelsea Flower Show. It all seems such a long time ago now as we move into a more autumnal feel, but worth revisiting I think. I am always surprised by the Chelsea Flower Show – surprised, excited, thrilled, exhausted and this year frozen too! Although what an amazing spectacle of natural beauty is to be found there. Behind the scenes there are thousands of dedicated and hard working people with a love of the natural, creating the most amazing show for us all. This year it was the centenary of the Show and it has been an honour and a privilege to have been part of the Show now for the past 9 years. I thought it worth recording some of the behind the scenes shots of this very special year. OOO so cold! I knew that feeling too. These peonies had their own little fleeces! Peonies, cow parsley and grasses featured majorly in the show this year. It gave me all sorts of ideas for additions to my wild flower meadow in fact, although it did seem rather strange to see quite so much cow parsley at The Chelsea Flower Show and we did even experience someone, as part of the sell off, buying a cow parsley plant from Chris Beardshaw's garden - seeming quite bizarre when the whole country was awash with cow parsley! - but the occasion gets you like that! "One hundred years ago this year, the Chelsea Flower Show was held for the first time. It was a three day affair Tuesday to Thursday 20th - 22nd May 1913. and there were 244 exhibitors. Roughly half of them were nurseries and a third were sundriesmen (manufacturers of glasshouses, retailers of gardening tools and chemicals, gardening magazines and makers of garden furniture). The remainder were a mix of amateur gardeners, representing the still-thriving world of country house gardening and garden designers". Waiting for the Queen (above) and the Queen meets Roger Platts on what was certainly my most favourite of all of the gardens -fabulous planting. The Before and After pictures of J's Pots & Potted Gardens stand and where would the up to date Chelsea Flower Show be without a fair share of celebrities! I am the king in the wood. At the death of winter. I am the laughter in the leaves. The mid 1800’s proved to be a very good time for the emergence of fine quality composition stone. Along with the likes of Blanchard, Blashfield and Coade Stone, Austin & Seeley’s new material proved to be so good for statues, urns, fountains and other ornaments for the garden that it was, in many instances, very difficult to tell it from real stone. It also proved to be durable enough to stand the test of time as well as the British weather. Over the years we have been lucky enough to have come across a couple of Austin & Seeley items and most recently have a wonderful figure of a girl feeding her dog . This is a charming study and it is in really good condition. We are very privileged to have it. There has been some restoration work as you might imagine on a figure of this age but relatively little. Dating back to the mid 19th C, this is a really special item. 54in high. Well – that does it for me!! We have had a sundial, a pair of acanthus leaf urns and now this lovely statue. We have a really lovely varied stock at the moment. Some huge staddle stones, sundials of varying grandness, a couple of bird baths, stone troughs, some wonderful copper pots and statues. One large Austin and Seeley, a lovely figure of a boy with his puppy in lead – J.P. White from early 1900s, a lead cherub on a tall stone pillar which is really pretty and then there are a pair of lead seasons figures which are very intricate and a Dickens type character in lead too. Such a lovely mixture of interesting and unusual items. This is a great time for gardens - summer is going on and on into Autumn. Soon the flowers will start to move towards Winter but statuary and stone, lead and copper remain to decorate your garden throughout. Why not check out our stock and see if that special something you have been looking for is waiting for you there. I have been asked by so many people to detail the planting I put into the troughs and coppers at the Chelsea Flower Show this year. I am very happy to do that and hope in future newsletters to come up with some planting ideas. It is so nice to have a garden in a stone trough – good depth of planting, cool soil, perhaps a solution for a difficult area of the garden and the stone complements the plants so well. It has to be said that for the shows I plant the troughs with many more plants than is necessary normally, so I would advise a lesser amount of each plant. However if it is the full look you want you will have to thin them out as they grow. So watch this space in the next newsletter and I will detail particuar plants that I have used.